Tyrone made the perfect start to life back in Division One of the Allianz National League when they saw off the challenge of visiting Roscommon at Healy Park on Sunday afternoon. The Red Hands recovered from conceding an early goal, as well as the setback of losing the influential Mattie Donnelly to a head injury after only a quarter of an hour. In that first half Roscommon created four good goal chances but took only one of them and when Tyrone greeted the short whistle 0-10 to 1-2 in front, the Connaught men had it all to do. To their credit they came out fighting for the second half and going into the final quarter only three points separated the two sides but Tyrone then moved through the gears to double their advantage and deservedly take the spoils. In doing so they were the only home side to win in Division One at the weekend and it sets them up nicely for their mouth-watering clash with All Ireland champions Dublin at Croke Park this Saturday evening. Darren McCurry turned sharply to kick the opening point after only 22 seconds but a minute later Roscommon struck for a goal when Ultan Harney off-loaded the ball to Niall Daly who smashed it to the roof of the Tyrone net. McCurry and Colm Cavanagh brought the home side level but it took a good save from keeper Mickey O’Neill to prevent Harney from getting in for a second Roscommon goal. Peter Harte and Conor Devaney exchanged points and after the former had put Tyrone into the lead O’Neill thwarted Ciaran Murtagh at the other end of the field. Ronan O’Neill and Harte knocked over frees for the winners but at the back Tyrone continued to look vulnerable with O’Neill saving again this time from Sean Mullooly. Donie Smith had Roscommon’s second and last point of the opening period as Tyrone closed out on top, Harte on target from a free with wing half backs Tiernan McCann and Jonathan Monroe both supplying quality points from play. Smith opened the second half scoring after only 11 seconds and when the same player split the posts in the next attack as well it demonstrated that Tyrone still had a bit of work to do. A well taken point from Niall Sludden got the Red Hands up and running though before a brace of O’Neill frees opened up a gap again. Roscommon hit the next three points of the game, all from substitutes, John McManus, Niall Kilroy and Fintan Cregg the players on target. The gap was down to a single score again but Tyrone didn’t panic as Sean Cavanagh and Mark Bradley were sprung from the bench to telling affect. Cavanagh provided the pass for Bradley to score and moments later the same player added a beauty from out on the left wing. Conor Meyler and Conall McCann tagged on points with Cregg replying for the visitors. It was Tyrone though who had the final say with a terrific effort from distance from Sludden as they got their campaign off to a winning start. 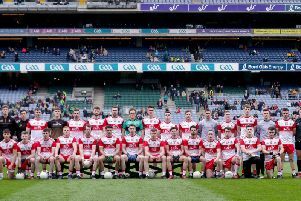 Tyrone: Mickey O’Neill; Padraig Hampsey, Ronan McNamee, Cathal McCarron; Tiernan McCann, Mattie Donnelly, Jonathan Monroe; Colm Cavanagh, Declan McClure; Conor Meyler, Niall Sludden, Peter Harte; Darren McCurry, Cathal McShane, Ronan O’Neill. Roscommon: Colm Lavin; David Murray, Thomas Featherston, Niall McInerney; Ronan Stack, Sean Mullooly, Conor Devaney; Kevin Higgins, Tadgh O’Rourke; Niall Daly, Sean McDermott, Enda Smith; Donie Smith, Ultan Harney, Ciaran Murtagh.